Webster University’s Department of Biological Sciences has become one of only 14 research groups nationwide to be selected for Cohort 9 of the Howard Hughes Medical Institute’s SEA-PHAGES program. SEA-PHAGES stands for Science Education Alliance-Phage Hunters Advancing Genomics and Evolutionary Science (#seaphages). This discovery-based undergraduate research curriculum provides students hands-on experiences discovering novel phages (viruses that infect bacteria) from outdoor environments and teaches the students to computationally analyze the viral genomes for annotation and comparative genomics. Webster professors Mary Preuss, Stephanie Schroeder, and Victoria Brown-Kennerly team-teach the program, which spans two semesters and brings authentic scientific inquiry to students of all majors through the courses: BIOL 1350 Phage Discovery, and BIOL 1580 Introduction to Computational Biology. 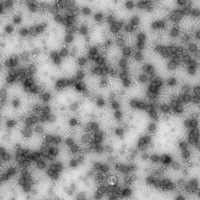 A solitary phage virion (center) is isolated and characterized by Webster University undergraduate students. Students AbdAllah Mitchell (left) and Kayla Miller (right) document their phages, using the electron microscope at Washington University in St. Louis, which serves as a “buddy institution” for Webster University in the SEA-PHAGES program. The Howard Hughes Medical Institute (HHMI) s a science philanthropy whose mission is to advance biomedical research and science education for the benefit of humanity. Webster's commitment to the new Interdisciplinary Sciences Building and recent initiatives such as the Student/Faculty Collaborative Research Grant, external grant-seeking efforts, the Research Across Disciplines Conference and other initiatives are demonstrating Webster's commitment to meet this challenge. In 2016 Webster was awarded more than $1 million in grants from the National Institutes of Health (NIH) and the National Science Foundation (NSF) to support faculty research and to provide scholarships for students transferring to Webster in the biological sciences. Webster was one of four institutions worldwide and one of only two in the United States to receive the NIH Biomedical/Biobehavioral Research Administration Development grant in that round of funding. Webster was also one of only five colleges in Missouri to receive grants from both the NIH and NSF last year.